Cook finely chopped garlic, ginger and onion in a pot until golden. About 20 min. 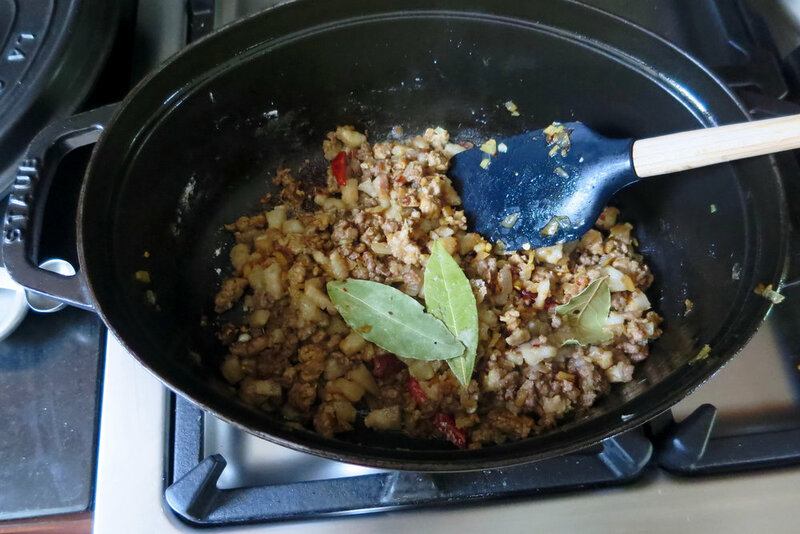 Add meat, chili and bay leaves. Stir. Add flower and half of spice mix. Stir. Add broth and tomato. Crush tomato and stir more. Add one tsp of salt. Cover and cook for about 30 min. Chop spinach into 1/2" strips (1.3 cm). Heat oil in pan and cook spinach over high heat for about 1 min. Sprinkle some salt. Add spinach and remaining spice mix in pot. Cook for about 5 min. Taste and add salt as necessary. Serve on rice with slices of cheese to aside. The creaminess of cheese matches with the heat of spices. Quick pan-frying removes unpleasant astringency from spinach.